Featured image: A woman living in the New York City subway. Liberation News photo. 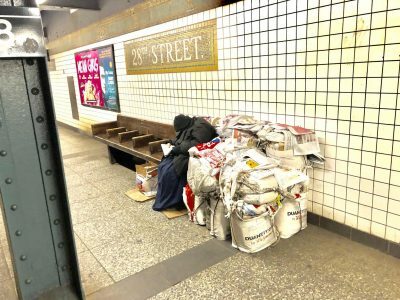 Picture the Homeless, a NYC-based organization that advocates for the rights of homeless people and affordable housing solutions, recently published a report that highlights the inadequacy of Mayor Bill de Blasio’s so-called progressive plan to tackle the housing crisis. The group goes so far as to claim there is a “shelter-industrial complex” which has as its main priority securing funding instead of ending homelessness. The homelessness crisis in New York City is dire. There are approximately 76,000 homeless people here according to the Department of Housing and Urban Development. In one of the richest cities on earth, there are over 18,000 children who don’t have a roof over their heads thanks to unchecked real estate speculation and the commodification of housing. In fact, almost 30 percent of the country’s homeless families with children can be found here, according to DHU. On top of that, roughly 1 million residents rely on outdated, underfunded public housing. Rather than addressing the root cause of homelessness by building long-term housing that all can afford, the city’s approach prioritizes for-profit development and homeless shelters. The city government’s emphasis on for-profit housing development will likely make more people homeless, and the over-emphasis on shelters will actually prolong the homeless crisis, Picture the Homeless says. Homelessness is not the result of individual shortcomings or “laziness.” The primary cause is the lack of affordable housing. Working class and poor people don’t get to decide how much rent will cost, which is oftentimes over 30-50 percent of wages. Nor do we have guaranteed access to healthcare, including mental health services. Medical emergencies that cause job loss or inability to work are oftentimes the straw that breaks the camel’s back when it comes to housing security. Another contributor to homelessness is the lack of legal protections for LGBTQ children who are often forced to leave their homes due to bigotry, abuse and violence. LGBTQ young people make up 40 percent of homeless minors in the U.S. today, and many of them wind upon the streets of New York City. Why are rents too high? All fingers point back to the city government and capitalist developers as the ones to blame. In the name of “cleaning up” the city’s image, construction of luxury housing has raged unabated for decades at the expense of working class communities, particularly Black and brown working class communities. On paper, it looks as though de Blasio is attempting to turn this trend around and develop more affordable housing. The city’s primary response, however, is pumping over $1.8 billion into shelters. While shelters play a necessary part in the fight against homelessness, they are an incomplete and dehumanizing solution. The Picture the Homeless report questions the disproportionate role of shelters in the Mayor’s plan, when permanent subsidized housing could best help homeless individuals and families get back on their feet. “Over the next 7 years, the city will spend more on operating shelters than the amount of city subsidy required to create new housing for every single homeless household in NYC, ” the group says. This will prolong the crisis rather than resolve it. One of the report’s key advantages is that it clearly defines some of the technical language associated with zoning and housing laws. Local politicians sometimes hide behind this language so only they can tell the public what is “possible,” “impossible,” or “affordable.” As organizers and activists, we need to make use of this language to articulate an alternative vision based on the idea that people have a right to a home and a right to live in the communities they grew up in without the fear of racist gentrification/displacement. Area Median Income, or AMI, is one such politically loaded term. AMI is a U.S. Department of Housing and Urban Development standard that looks at the median, or middle figure of reported incomes in a given area. The AMI figure is used to establish standards for assessing poverty/affluence relative to one’s peers. Politicians have been quick to call anything below AMI “affordable” for everyone. However, a family who can only afford housing at 15 percent AMI will not be helped by projects developed for households at 50 percent AMI. Rather than providing genuinely affordable housing for the city’s poorest residents, de Blasio’s plan is accommodating to for-profit developers and prioritizes the needs of lower middle income families. While the creation of some new units, even if only affordable to middle income residents, provides a much-needed respite from seemingly limitless rent hikes, the mayor’s strategy is not intended to rapidly assist those most negatively and most violently affected by the housing crisis. Residents of neighborhoods targeted for rezoning countered by demanding that the city provide housing they could actually afford, and subsidies in local affordable housing developments, especially those built on public land. They were told by the city that this was “too expensive,” “not economically viable.” Low income housing, the city said, had to be “tied to a greater number of units at market rate rents or, in some cases, “affordable” rents that met or exceeded the market rate in rezoned neighborhoods,” the report says. To make up for the lack of deeply affordable units, the city continues to rely on shelters to pick up the slack. Picture the Homeless identifies a “shelter-industrial complex” that, rather than trying to solve homelessness, relies on homelessness to exist in the first place. Shelter staff, administrators and associated contractors receive funding based on the continued use of shelters. A whole business of homelessness has emerged and views homeless individuals as potential sources of revenue, thanks to the local, state and federal funding that keeps homeless shelters in operation. What should be a temporary, emergency measure on the path to ending homelessness has become the solution in and of itself. The Picture the Homeless report calls for diverting resources away from shelters to preserve and expand housing for the most at-risk individuals and families; capital subsidies to develop new affordable housing for people below 30% AMI; and a more rigorous inspection and accountability process for the shelters that remain open. Despite harsh conditions, a hostile political environment and government inaction, many homeless advocates and housing groups continue to fight for real change in New York City. Most recently, Picture the Homeless was instrumental in getting the City Council to agree to audit all vacant city-owned land with the intention of developing truly affordable housing on it in the future. In East Harlem, rent stabilized tenants have filed a suit to stop that area’s rezoning for high-rise luxury buildings.